Galazer is a combat game which won’t give you time to take a breath. Feel the frenziedaction, control your senses andput your reflexes to the test. If you blink, you’re dead! 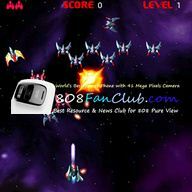 Galazer is the definitive game in its category for Nokia, with previously unseen playability, control accuracy and addictiveness, filled with incredible graphics and a spectacular soundtrack. Put your senses on Galazer. Feel the Power of the Stars in your hands!